The days are getting shorter, the kids are back to school, and it’s once again socially acceptable to put pumpkin spice on the menu! It’s the perfect time to “Fall Back into Routine” and freshen up your entire kitchen including your appliances. 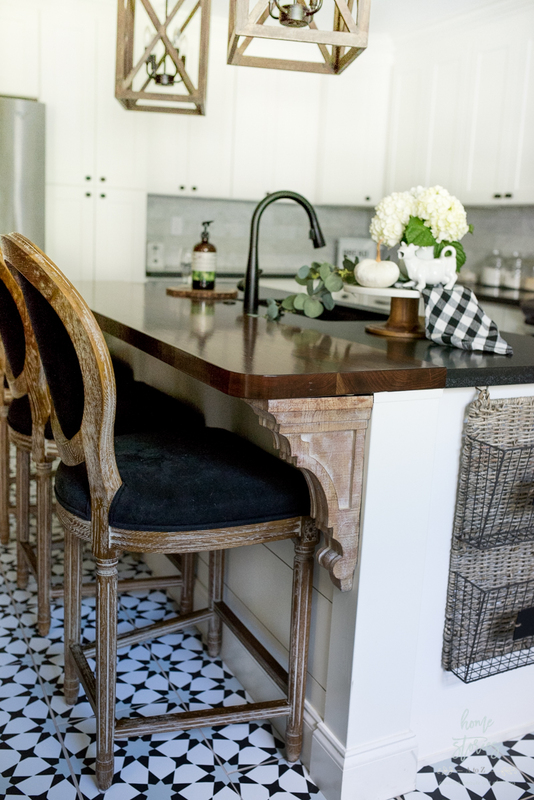 Today I’m sharing 5 cleaning tips to keep your kitchen clean and tidy for fall! This post is sponsored by affresh®. All pictures, tips, and opinions are my own. It’s amazing how clean one can keep the kitchen when it’s not often used! During the summer, our family eats out a lot and also enjoys grilling and dining al fresco. As a result, the kitchen stays blissfully clean! Now that our hectic fall schedule is in full swing, the daily hot breakfasts, school lunches, after school snacks, and quick dinners are taking a toll on the kitchen. 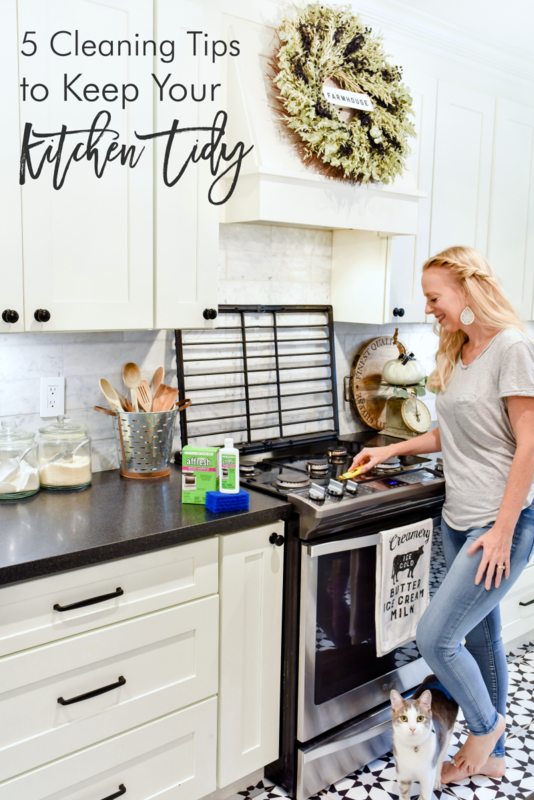 It’s time to fall back into a good cleaning routine, and today I’m sharing my top 5 tips that help me keep the kitchen tidy during the school year! 1. Eliminate countertop clutter and create drop zones for paper clutter. One of the things I seem to struggle with each fall is how to properly manage the endless school papers and projects that inevitably find their way onto the kitchen counters! Even when my kitchen is technically clean, a cluttered countertop makes it feel less so. 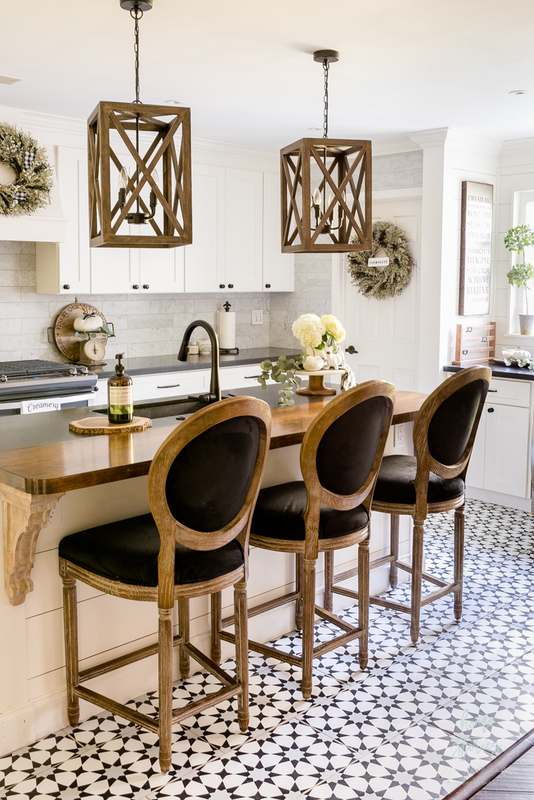 Here are some quick countertop tips I’ve re-implemented this season to keep the counters clutter-free! Follow the two appliance rule and only allow your two most frequently used appliances to remain on the counter. Keep the rest of your appliances stored in cupboards or your pantry until needed. We keep a toaster and pressure cooker on the counter. The coffee machines have their own beverage bar. Keep most of your dry foods stored in the pantry and off of countertops. Consider storing frequently used food items in pretty glass jars. Since I bake more frequently in the fall, I do keep essentials such as sugar, flour, and baking mixes on the counter in pretty glass containers with metal scoops. Use vessels such as crocks, or even a repurposed vase, to corral wooden spoons and frequently used kitchen tools. I use a faux olive bucket to store our wooden spoons. Create a drop zone within your kitchen to manage paper clutter. I use a hanging wall file on the side of our kitchen island to organize bills and school papers that need signatures. If papers are placed in the file, I know they need attention before I go to bed that night. My goal is to keep the files as empty as possible so clutter doesn’t build! 2. Keep appliances clean with affresh®. 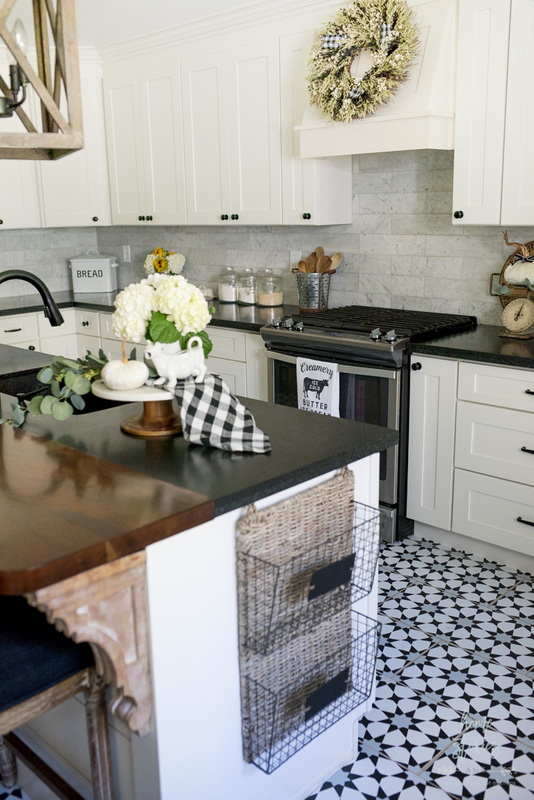 While I find it easy to keep my countertops and cabinets clean, kitchen appliances can be tricky. 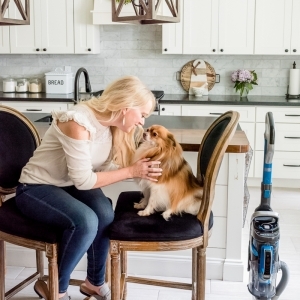 I own many different kitchen cleaners but sometimes wonder which cleaning product is best to use on which appliance—and apparently I’m not alone! According to an online survey conducted by affresh®*, 34% of participants also have issues finding the right cleaning products for their appliances. What I love about affresh products is that they have created a wide-range of appliance cleaners specific to the job at hand, making it easy to keep things clean and working their best. 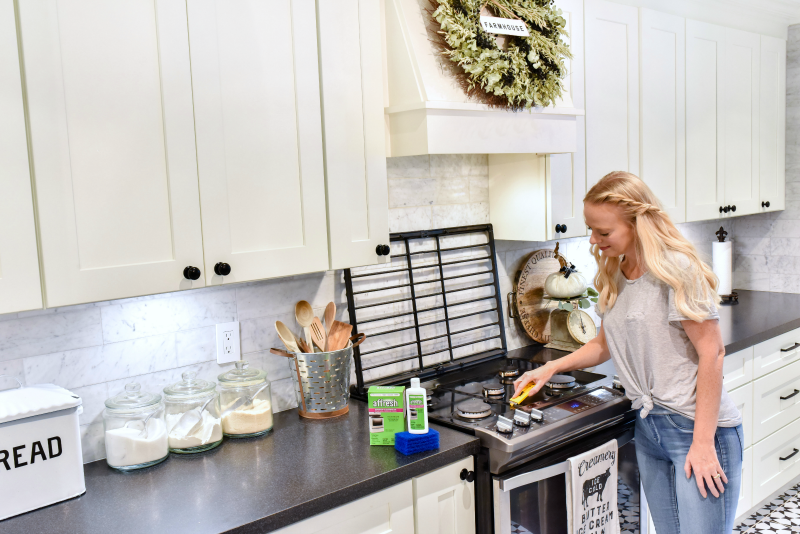 Affresh stove top cleaner comes with everything you need right in the box, and the results are impressive. I really didn’t think my stove top was very dirty until I began using the provided cooktop scraper and saw all of the build-up freed from around the burners. I thought the dull residue around my burners was permanent, but after using affresh my cooktop once again looks shiny! Want to try affresh® cleaners for yourself? For a limited time, affresh® is offering $1.00 off any ONE (1) affresh product; visit https://amzn.to/2QejjnB to claim yours by using 1AFFRESHFALL. 3. Teach all family members to empty the dishwasher and sink and clean up dishes and pots/pans as you go. I rarely allow a sink full of dirty dishes to accumulate. Everyone in our family knows that a dirty dish has a home in the dishwasher! As I’m cooking, I clean as I go and load dirty dishes in the dishwasher. Teach your school-aged children how to load and unload dishes and how to properly wash pots and pans, and I guarantee that your kitchen will stay cleaner! My boys help load and unload the dishwasher every single day and also wash all of the dirty dinner pans. Enlisting the help of the entire family to keep the kitchen clean will lighten your load and establish healthy routines during the school year! 4. Keep countertops and cabinets clean and crumb free. Whether you prefer to wipe down your kitchen surfaces with a rag, sponge, or microfiber cloth it’s important to have your cleaning supplies ready and available for everyone in the family to use. Teach family members to be on the lookout for messes on the countertops, cupboards, or walls that can be wiped down as you go. It is equally important to teach family members to hang rags or cloths up to dry between uses and to change out your used rag or sponge frequently. Sponges and dirty scrub brushes can be placed in the dishwasher for disinfecting. Dirty rags and cloths should be laundered frequently. 5. Clean the kitchen floor. Vacuuming frequently and spot cleaning your floors will help keep the kitchen and the rest of your home clean. With three shedding pets and two messy boys, I like to vacuum our kitchen floors daily. I use a small cordless vacuum for the job and it takes me less than five minutes from start to finish. Also, immediately spot cleaning any spills or messes will cut down on your need to deep clean the floors. I hope these tips help you fall back into a good cleaning routine this busy fall season. I often joke that the rest of the house can be a disaster as long as my bed is made and my kitchen is clean! A clean kitchen just makes me feel more in control of the inevitable chaos that comes with our fall routine. Following these tips ensures that the heart of our home stays tidy and livable! I believe they can that for you too! I love your tips, really useful. And I have to say that your kitchen looks adorable, great job.